The Allure of Nymphets: Chanel vs Kaia Gerber: Who Uses the Allure of Nymphets the Best? Chanel vs Kaia Gerber: Who Uses the Allure of Nymphets the Best? Chanel has come under fire for using Cindy Crawford's teenage daughter in its latest accessories campaign. The French fashion house snapped up Kaia Gerber, 16, to model its SS18 handbag collection but has divided shoppers over images posted online which show the model reclining on a sofa in Gabrielle Chanel's Parisian apartment. Reacting on Facebook and Instagram this week, customers vented their fury at Chanel's choice to use the model, claiming she is 'too young' and claiming she is 'barely dressed' in the photos. 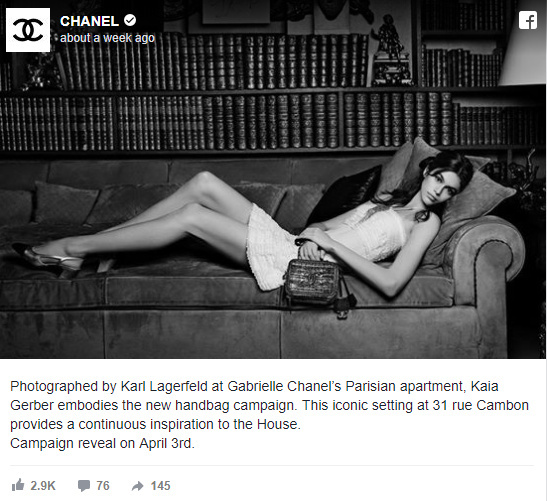 However, some of Kaia's social media postings and a number of paparazzi photographs taken of the teen model are far more revealing than the Chanel advertisement. Here are some recent photographs of the nymphet sunbathing and frolicking in Miami. Not only is Chanel using the allure of nymphets to sell (overpriced) handbags but Kaia is using the allure of nymphets for self-promotion. Don't think for a second that Kaia didn't anticipate that pictures of her red (cheeky) thong wouldn't be all over the Internet within minutes after she exited her swanky hotel room. Update 6/11/18: Here's the advertisement in the Summer 2018 issue of Vanity Fair.